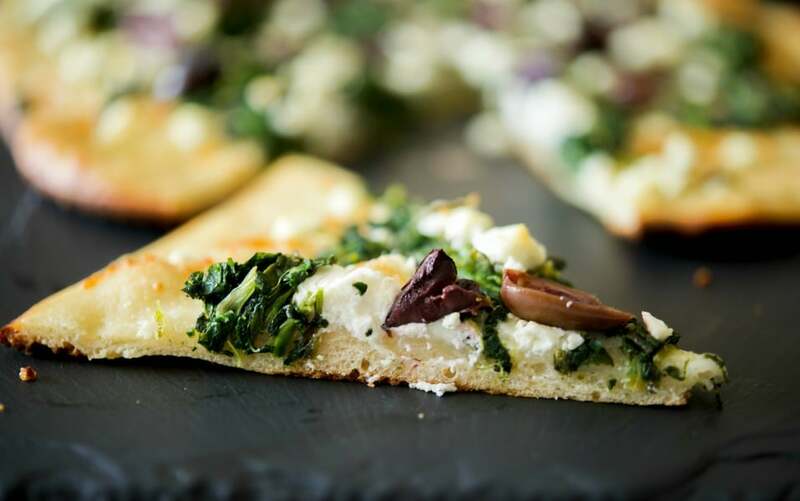 This tasty flatbread made with organic chopped spinach, crumbled Goat cheese and tangy Kalamata olives makes a tasty appetizer or quick weeknight meatless dinner. Remember when I told you that my family threw a surprise dinner for my 50th a couple of weeks ago? Well the restaurant sent home some of the cheeses that were left from the cheese board that night and in the selection was crumbled Goat Cheese. I love it, but don’t buy it that often so I was happy to have some to savor another day. I was in the mood for homemade pizza last Friday so I decided to make a new version of flatbread using the remaining Goat cheese and some ingredients I had in the house already: organic chopped spinach, shredded Mozzarella cheese, pizza dough, and Kalamata olives. You can make your own pizza dough, but l if I’m looking to make a quick dinner, I don’t want to bother with making homemade dough. Besides being that I live in NJ, we get some pretty good fresh or frozen pizza dough at our local pizzeria or supermarket (I think it has something to do with the water!) In any event, you’ll need 1-pound of dough for this recipe. Bring the dough to room temperature; then stretch the dough by using your hands that have been greased with a little EVOO. I also use an old sheet pan to make my flatbread and pizzas on and grease that well with EVOO as well. I find it gives the flatbread a really crispy crust. You can use a seasoned pizza stone too, but over the years I’ve decluttered my life and have gotten rid of all of those small kitchen gadgets and those items you only use once in a while; only keeping those that I can use for multiple purposes. (Now if only I could cut back even more on my two utensil drawers!). 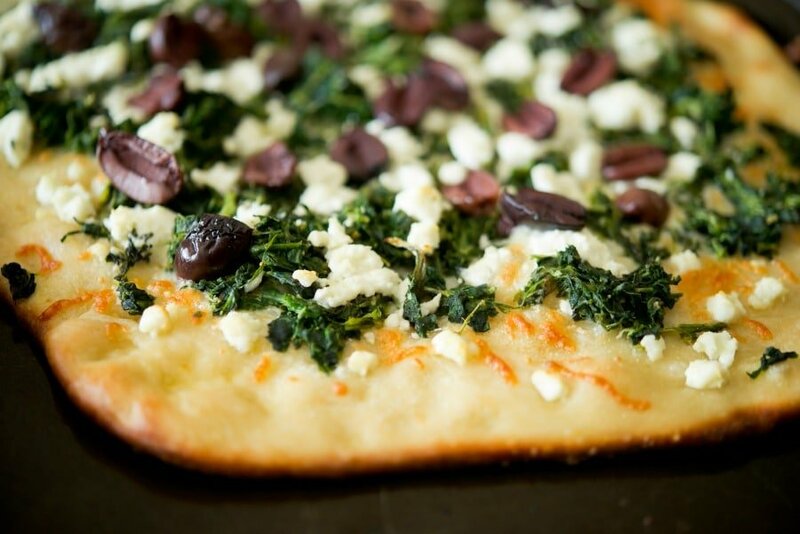 Anyway, once you stretch the dough to about 1/2-inch thickness, you can add your toppings. 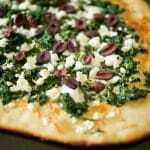 First, I topped the dough with the Mozzarella; then added the spinach, Goat cheese and olives. It takes about 10 minutes for the prep. Place the pan into a 425 degree F preheated oven and cook for 15-20 minutes until the crust is golden brown around the edges. 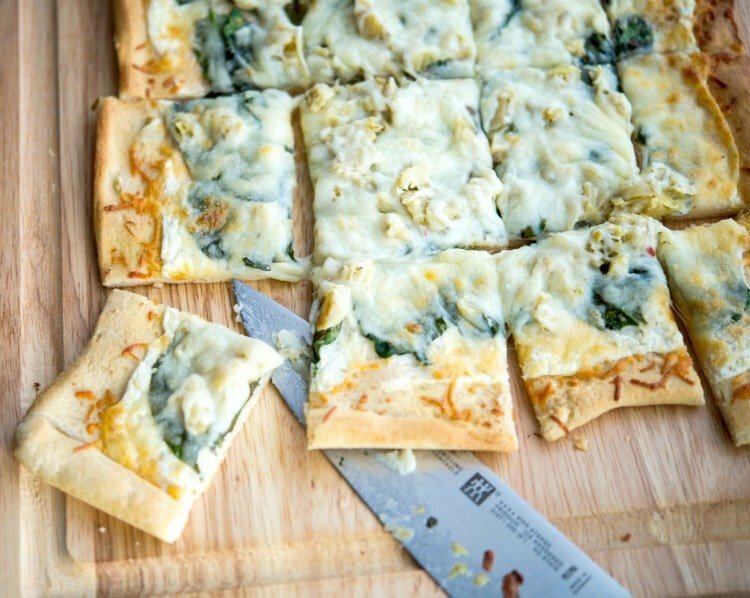 Place the flatbread on a large cutting board or SlatePlate; then cut it into pieces. If you’re serving this as an appetizer, you can cut it lengthwise down the middle; then cut each half into thin strips (you’ll get about 12-14 strips. Or if you’re serving this for dinner, you’ll get about 8 slices. 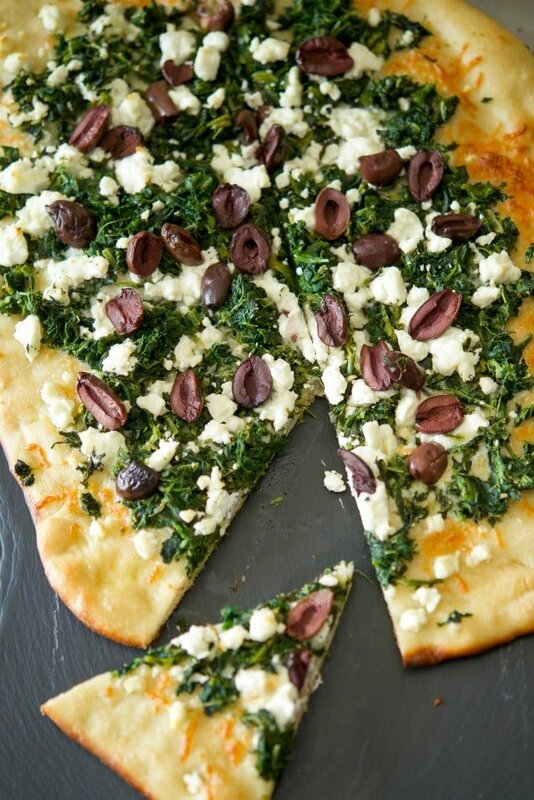 My family LOVED this Spinach, Goat Cheese & Kalamata Olive Flatbread; even the young one (who just picked the olives off). ~Enjoy ! Spread the oil on top of an old sheet pan; then stretch the dough to about 1/2-inch thickness. 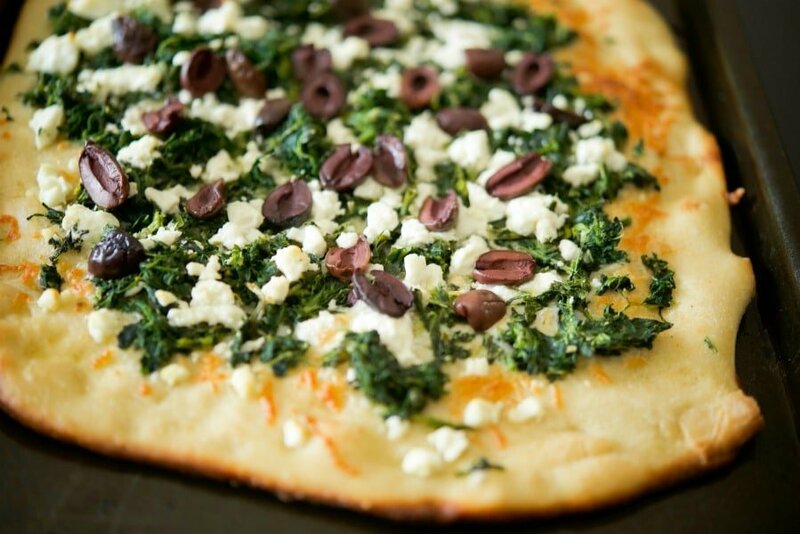 Top the dough with the Mozzarella cheese, spinach, Goat cheese and olives. Leave about a 1" border around the edges. Place the pan into the oven and cook for 15-20 minutes until the crust is golden brown around the edges. Remove from oven. 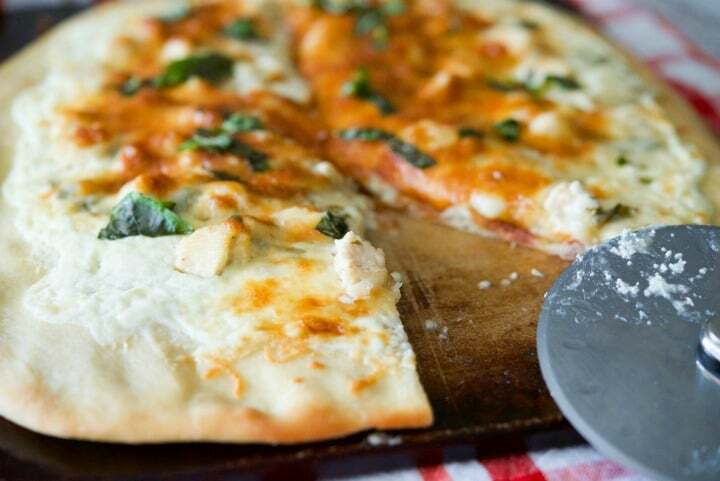 Place the flatbread on a large cutting board; then cut it into pieces. *If you're serving this as an appetizer, you can cut it lengthwise down the middle; then cut each half into thin strips; you'll get about 12-14 strips. 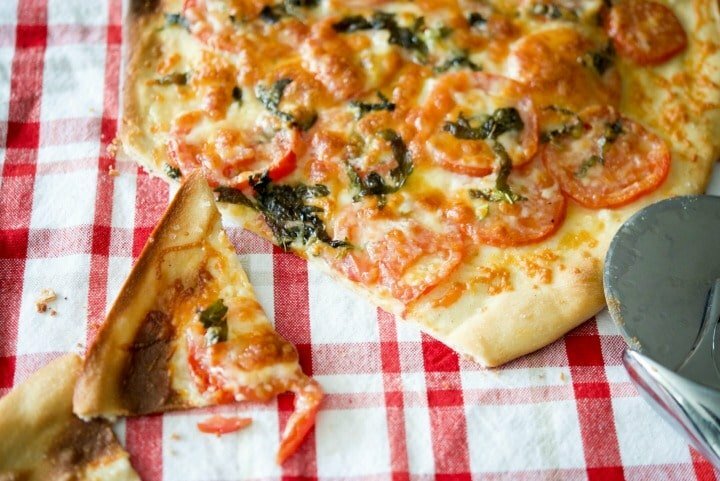 Or if you're serving this for dinner, you'll get about 8 slices. 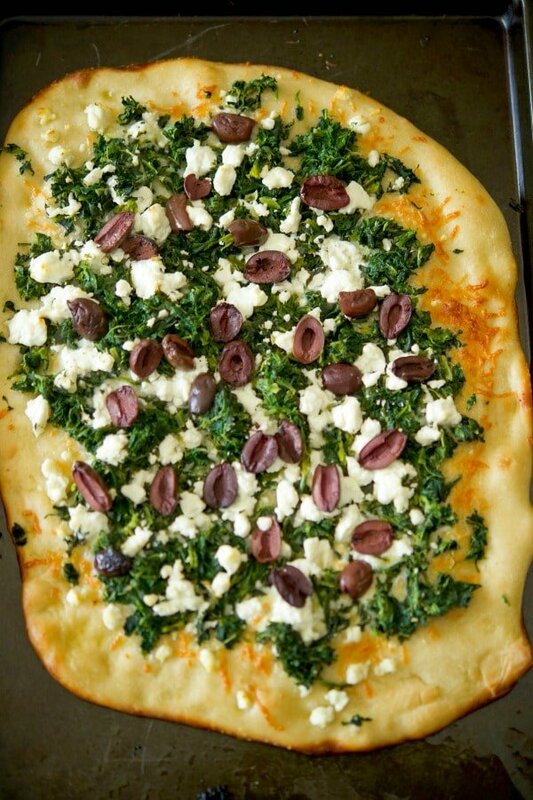 Or follow my Pizza & Flatbread Pinterest Board for more recipes!